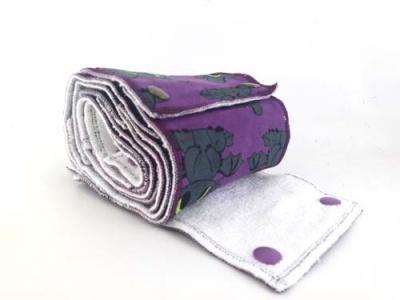 Soft reusable toilet roll, cotton jersey top and backed with bamboo terry. 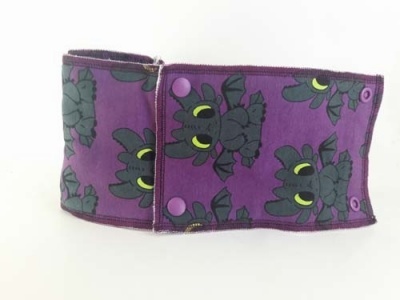 Fabric tube included. Reusable washable toilet roll for the whole family. This smart loo roll is designed to be placed in your toilet roll holder. There are 10 cotton jersey wipes, backed with bamboo terry. Wipes measure approx 6.5" x 4.5". Each wipe has poppers that easily snap together around the fabric tube. The fabric tube is the final wipe, snapped to create a clever tube. Please, wash before first use. Just snap all wipes together around the fabric tube, make a roll and add on your holder! Wash up to 60C and tumble dry on low. Your family cloth will last longer if you wash on cool and hang to air dry. To air dry - snap wipes together and peg on the line. Feel free to use both sides when wiping. Use the same as disposable toilet paper but without flushing it away. Just pop the dirty wipes in a wet bag. When you are ready to wash just unzip your wet bag and throw the bag in your washing machine. There is no need to touch the wipes until they are clean. Wet bags can be purchased separately here. Some parents also find these wipes helpful when toilet training their child. All fabrics are pre-washed on hot and tumble dried on hot to shrink the fabric. Please, note that some fabrics are more prone to shrinking then others if washed and tumble dried on hot.